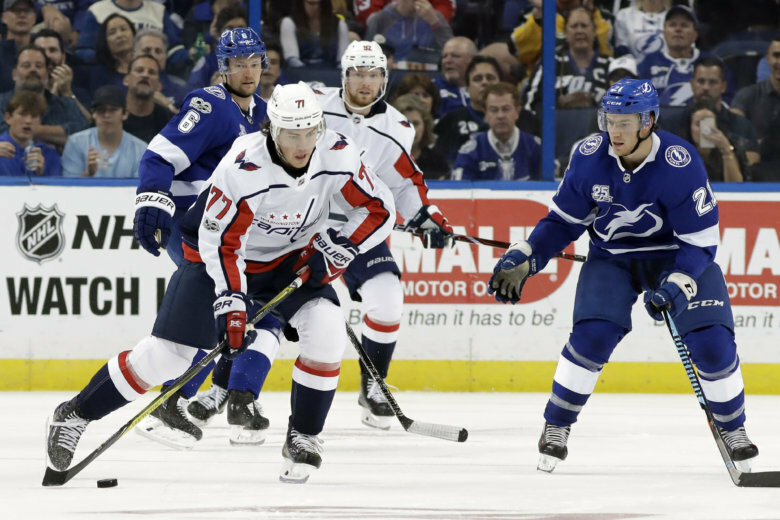 TAMPA BAY, Fla. — The Washington Capitals are on the verge of elimination after falling 3-2 to the Tampa Bay Lightning in Game 5 of the Eastern Conference Final. Tampa Bay now leads the series 3-games-to-2 with Game 6 Monday night at Capital One Arena. Hear the Capitals’ highlights below from Game 5 as called by John Walton and Ken Sabourin on the Capitals Radio Network. UPDATE I: Birthday boy Evgeny Kuznetsov (May 19, 1992) put the Capitals on the board with his 11th goal of the postseason. The Kuznetsov goal was among the few bright spots for Washington through the first 25 minutes of Game 5. The Lightning scored on the opening shift of the both first and second periods.to build a 3-0 cushion. Kuznetsov also established a franchise record with his 22nd point of the playoffs, the most in Capitals history in a single postseason. UPDATE II: With the Capitals trailing 3-1 and goaltender Braden Holtby pulled for the extra attacker, Alex Ovechkin converted with his 11th goal of the postseason to cut the Tampa Bay lead to 3-2.